The rabbit-tiger relationship may be one which might be tough to work out. At first the rabbit might be intrigued by the tiger, drawn to it’s powerful and noble nature, but soon the meek rabbits may be overwhelmed by this cantankerous animal. Now, to the tiger, the rabbit will most likely pose a challenge. And they love a challenge. Challenge means adventure. Challenge means risk. And the tiger man or woman loves all those things. The shy rabbit on the other hand – those things aren’t their cup of tea. These things are a little scary for them. And that may be something that will pull the two apart. The tiger will want to seek out danger and adventure in the wild beyond and the rabbit would rather crawl back into its hole. Let’s just say it’s a good thing that both these Chinese Zodiac signs are very independent as the rabbit-tiger compatibility does not give any guarantees. So maybe they won’t want to do the same things all the time, but there will be a mutual respect in the rabbit and tiger friendship. The rabbit will hold the tiger in high esteem for its moral beliefs. The tiger will defend justice to the death, often sticking up for the little man. And quite often this underdog is someone like the rabbit. They will be drawn to protect their lover and the rabbit will in turn feel loved and cared for, especially since it’s rather rare that anyone sticks up for them. The rest of the world usually just walks all over them. In turn, the tiger will respect the rabbit man or woman for their noble character, appreciating their genuinely good nature and harmony with the world around them. In addition, the male ore female tiger’s passionate expression of its feelings will help calm the male or female rabbit’s insecurity. That is, if they express their mad love to the rabbit. Any other feelings might be cause for alarm, as the tigers show feelings more deeply and more intensely than any other Chinese astrology sign. When this sign is in love, the whole world knows it. But the whole world also knows when it’s mad, too. Unfortunately, Chinese astrology compatibility predicts that the tiger may soon get bored. They are one of the most lively of the Chinese Zodiac. If they don’t receive constant stimulation, be it physically or mentally, they will quickly move along, darting for the next perilous venture, leaving the rabbit in the dust. They can’t stand boredom, much less in a relationship resulting in a breakup between the rabbit-tiger soulmates. In any situation, the Chinese tiger animal sign is a handful. And the rabbit is the one of the least capable to handle it. It’s just that they will not know what to do with their bold partner, most likely causing them to retreat. Even in bed, it is the same story as the tiger will try to sexually dominate the demure rabbit. The issue with the rabbit and tiger marriage is not that they are such a horrible match for each other. It’s more that they just are not the most perfect. Both have such great potential to make a difference in the lives of those around them, especially when they use their signs’ characteristics to the fullest. But the Chinese compatibility between the rabbit and tiger in love mutes those attributes significantly. It doesn’t allow for either to be completely themselves, instead it stifles both parties. Nor will this relationship have the sparks that one would expect from a romantic interlude. The rabbit and the tiger compatibility is just not meant to be for a long time in most cases unless there is intervention of some kind. 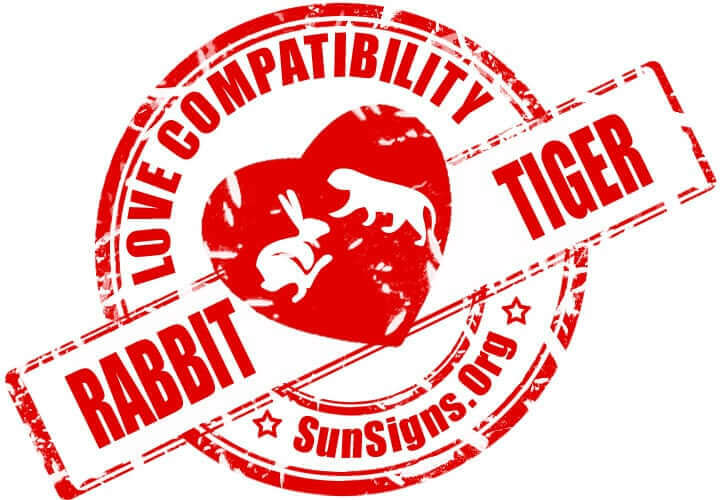 Rabbit & Tiger Chinese Horoscope Compatibility Rated 3 Hearts!